Enjoy our breathtaking offer at Top of the Carlton. When it's time to relax and unwind, let "time out" steer you upwards to our beautiful rooftop terrace Top of the Carlton Sky Lounge, for enjoying a drink in the clouds. 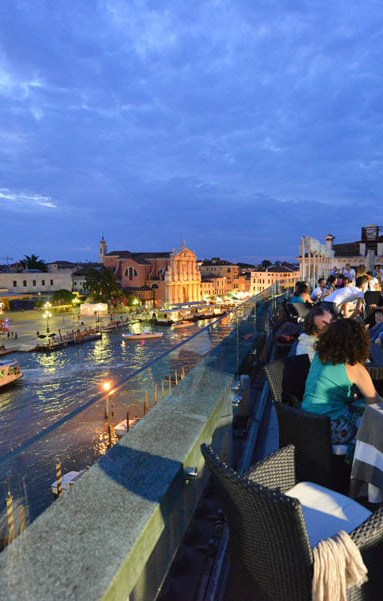 Enjoy breathtaking 360-degree views of Venice from Hotel Carlton on the Grand Canal’s Sky Lounge listening to music while you sit and choose your favorite cocktail on the extensive drink menu. And then make your way to our La Cupola Restaurant to partake a romantic candle lit dinner for two. VIP arrangement in your room including bathrobe, slippers, VIP courtesy kit and a special surprise. In case of bad weather, the cocktail will be served in our elegant Carlton Café.